As a general’s daughter in a vast empire that revels in war and enslaves those it conquers, seventeen-year-old Kestrel has two choices: she can join the military or get married. But Kestrel has other intentions. One day, she is startled to find a kindred spirit in a young slave up for auction. Arin’s eyes seem to defy everything and everyone. Following her instinct, Kestrel buys him—with unexpected consequences. It’s not long before she has to hide her growing love for Arin. But he, too, has a secret, and Kestrel quickly learns that the price she paid for a fellow human is much higher than she ever could have imagined. 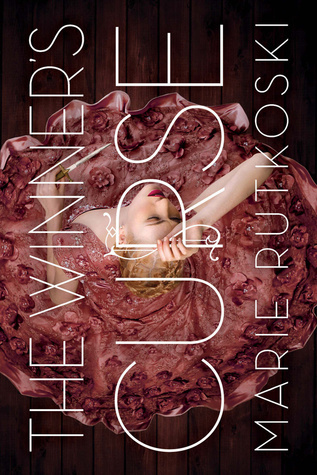 Set in a richly imagined new world, The Winner’s Curse by Marie Rutkoski is a story of deadly games where everything is at stake, and the gamble is whether you will keep your head or lose your heart. What is a winner's curse? The ‘Winner’s Curse’ is an economics term that means you’ve gotten what you wanted – but at too high a price. What would I pay too much for? The problem is I'm a bargain hunter. I often pass up things I want because the price is too high. The only thing I would willingly pay too much for is my family and friends safety and happiness. If it is for them though I don't think any price is too high. On a lighter note I would probably pay wwaayy too much for a purse! I have the hardest time finding cute purses. If I was to find one that was both cute and functional it would be the equivalent of finding a unicorn. I couldn't pass that up! Marie Rutkoski is the author of the YA novel The Shadow Society and the children's fantasy series The Kronos Chronicles, including The Cabinet of Wonders, The Celestial Globe and The Jewel of the Kalderash. Her next project is a YA trilogy that begins with The Winner's Curse, which is scheduled to be published in March 2014. Marie grew up in Bolingbrook, Illinois (a suburb of Chicago), as the oldest of four children. She holds a BA from the University of Iowa and a PhD from Harvard University. Marie is currently a professor at Brooklyn College, where she teaches Renaissance Drama, children's literature and fiction writing. She lives in New York City with her husband and two sons. I have the tendency to buy books in every format, even if I already have the book. Cover changes, limited editions, extended scenes; I get a little carried away. I'd choose The Winner's Crime! I'd choose The Winner's Crime because I've been waiting so long to read it! My winner's curse would probably involve a time machine so I could travel into the future and buy books that aren't coming out for months. *cough* The Winner's Crime *cough* Family always comes first, but if they're not in need, I would say that my current winner's curse is buying too many tea cups and books for what my wallet can afford. I'd choose the Winner's Crime as I already have the Winners Curse! I always pay too much to fly home and see my parents! The Winner's Crime!!! Thanks for the giveaway!!! I would pay too much to go travel to author signing events... But they're just so much fun! I would choose The Winners Curse. I would pay a lot for my dog if she was sick or travel to japan. thanks for the giveaway! I'd choose the Winner's Curse! Love the covers for these books, they're gorgeous! ~ Danielle D.
I would choose the Winners Crime since I already have the first book. I haven't read it yet but I would love to marathon the two. I've heard such good things about the series already, I can't wait to read them! Thanks for the giveaway! As for thing I would pay too much, I think it's art, or a very good book. Lastly, thanks to you for this giveaway and madam Marie Rutkoski for writing these books. Ooh I haven't read any books in this series yet but I do own the first one already, so I would love to have the second as well. Thanks for the great giveaway. I would pick the Winner's Crime. I just reread The Winner's Curse, and that last line, ugh, kills me every time XD Thank you for the giveaway! I want The Winner's Curse so bad. I would choose Winner's Crime--I can't wait to see what happens!! I think the only thing that I'd pay too much for would be to help the people I love most in the world! I would choose the Winner's Crime since I've already read Winner's Curse. I would pay too much for my family, if the need arose. I would choose The Winner's Curse because it's the first in the series and I still haven't read it. I would choose The Winner's Crime because I recently purchased The Winner'd Curse. I have a tendency to overspend on shoes. But in all fairness to myself, I am a teacher and I'm on my feet all day which is why I allow it! I would pick The Winner's Crime because I have (and seriously need to read!) The Winner's Curse! I would pay too much to be able to time travel. Give me a time machine and you can have all my monies! PS: Thank you for the giveaway! I would choose The Winner's Crime, since I have the first book :) My own winner's curse is that I love buying books, but I buy so many I don't have time to read them all!! I would love to have The Winner's Curse. It's definitely on my TBR list! I just got The Winner's Curse, so I would pick The Winner's Crime. I'm really looking forward to starting this series it sounds awesome. I would choose the winner's curse. It's high up on my to read list.